Jorge Fernández Guerra was born on the 17th June 1952. 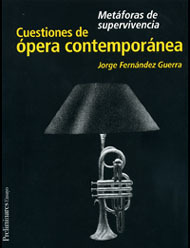 He studied music in the Royal Conservatory of Music in Madrid with Conchita Rodríguez, piano; Hermes Kriales, violin; Federico Sopeña and Antonio Gallego, History of Music; Ángel Arteaga, harmony; Francisco Calés, counterpoint and fugue; and Luis de Pablo, composition, analysis and non-occidental techniques. In the seventies, as he continued with his musical studies, he joined the independent theatre movement that contributed to transform the Spanish scene. He studied theatre with José Carlos Plaza, William Layton, Arnold Taraburelly, Pilar Francés, Roy Hart Theatre… and became a stage musician, composer and even actor in groups like TEI, Tábano or CIT. In the early eighties he started to achieve renown as a composer, becoming very soon one of the most notable musicians on the Madrid scene. 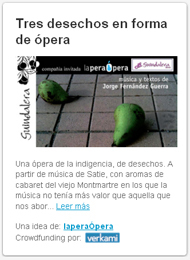 In 1986, the Spanish Ministry of Culture commissioned the first of a series of operas aimed at young composers. The result would be Sin demonio no hay fortuna, premiered in the Sala Olimpia, Madrid, in 1987, with great expectation. The New Grove Dictionary of Opera declared it to be: “the most important opera to have been premiered in Madrid since the advent of democracy”. In 1987, he premiered his first orchestral composition, Los ojos verdes, commissioned by Alicante Festival, and recorded later by the London Philharmonic Orchestra. In 1988, the Fundación Juan March in Madrid chose him to close the Gallery of Young Performers (with four more composers) – where he had been selected in its first edition in 1982. In 1989, he moved to Paris, where he lived until 1998, although he travelled regularly to Madrid. In Paris, he attended courses in the IRCAM and in the Université Européenne de la Recherche and he kept regular contacts with musical ensembles, like the Asociation l’Instant Donné, with whom he premiered two of his compositions: Espace Brisé (1994) and Regard perdu dans L (1995). He also fraternized with Spanish musicians living in Paris and with members of the visual arts avant-garde. Among his latest works it is important to highlight Don Quijote, music to accompany the film Don Quichotte, by G. W. Pabst, as part of the programme Concerts-Projection organized by the Orquesta de la Comunidad de Madrid and the Teatro de la Zarzuela. This composition, one-hour and a half long, was first performed on the 14th of April 2005 with great success. Part of it has been published in a CD (Naxos), devoted to Spanish music on Don Quixote. Remarkable also is the string trio Workin’ Problems, premiered in 2005 in the Fundación Juan March, Madrid, during its 50th anniversary acts; his string quartet, Bach is the name, commissioned and premiered within the Liceo de Cámara season of the Fundación Caja Madrid in October 2006; Nova, for instrumental ensemble, premiered in November 2006 in the Spanish Music Festival, Cadiz; Beyond Scarlatti, commissioned by the Sociedad Estatal de Conmemoraciones Culturales (SECC) and first performed on the 25th of November 2008 in the Residencia de Estudiantes in Madrid; La esfera de Pascal, a commission from Cuenca Religious Music Week, March 2008; About Klee, for orchestra, premiered in the Summer Festival at San Lorenzo de El Escorial, July 2009; and Los niños han gritado (2009-10), for an instrumental ensemble, still to be premiered. As a composer he has received commissions from the Círculo de Bellas Artes of Madrid, Centro para la Difusión de la Música Contemporánea (CDMC), Alicante International Festival of Contemporary Music, Orquesta Nacional de España, Fundación Juan March, Murcia Youth Orchestra Festival, Segovia Festival, Madrid Autumn Festival, Fundación Caja Madrid, Teatro de la Zarzuela, Festival Ensems of Valencia, Liceo de Cámara, SECC, Cuenca Religious Music Week and others. As lecturer, he has taken part in many courses and series of lectures: Instituto de Estética, Círculo de Bellas Artes, summer courses of El Escorial, Granada, Sevilla, Segovia, Cadiz, Malaga, San Sebastian, Alicante, Barcelona, etc. He has translated from French into Spanish for the publishing house Alianza Editorial (Couperin) and for Doce notas (Doce notas Preliminares). In 1992, he was the editor of “Madrid, European Capital of Culture” and in 1997, of the Teatro Real. In 1994, he established and presided the Asociation Musiques Croisées, created in Paris by a group of Spanish composers linked to French activity. With this association he carried out an ambitious work plan between Paris and Madrid. He has coordinated the Alicante Contemporary Music Forums (2008 and 2009), together with the Contemporary Music Professional Meeting of Alicante (2010), which took place in Alicante Music Festival. Since 2007 he has lectured in the Máster de Gestión Cultural de Santillana. As a music journalist, he has carried out an intense activity in media like Guía del Ocio, La Luna de Madrid, Tiempo, Radio Clásica, Diario 16, Pochiss.Rall., ABC, El Mundo, and El País, among others. In 1996 he established and directed, in collaboration with the art critic and editor Gloria Collado, the Journal Doce Notas and in 1997, Doce Notas Preliminares (a bilingual –Spanish/French- essay and artistic creation monograph). From 1998 to 2001 he was the music coordinator for ABC Cultural, the cultural supplement of the newspaper ABC. From 2003 to 2008 he worked with the newspaper El País (cultural supplement Babelia). From February 2001 to September 2010 he has been the Director of the Centro para la Difusión de la Música Contemporánea (CDMC) and of Alicante Music Festival, of the Institute for the Performing Arts and Music (Ministry of Culture). From 2001 to 2009 he has been a member of the Music Council of the Spanish Ministry of Culture. In 2005 he was appointed Chevalier de l’Ordre des Arts et des Lettres by the French Ministry of Culture. He was awarded with the Premio Nacional de Música for composition in 2007. He has been a member of the Art Council of the National Music Auditorium (ANM) from 2007 to 2009.